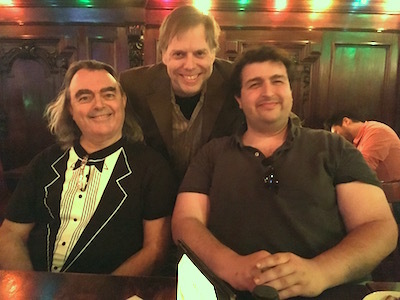 Playwrights Mark Knight, Nicholas Wardigo, and Greg Nanni, enjoying pints at Fergie’s Pub. It occurs to me this morning, that I have failed to blog about my impending reading tonight. Which is a little silly. Sure, I’ve had a lot going on and plenty to take up the pages of my blog, and yes, I certainly sent out plenty of emails (blanket and otherwise) to alert my gentle fans, but I never actually blogged about it. The play in question has been banging around Philly for the last few years. It’s called Pillowfights on Zeppelins and deals with an archeological team that discovers the remains of a ninth-century community of “diminutive people” in Greenland whom they believe to be the impetus behind the Santa Claus legend, and the television film crew from the cable-network science channel funding the expedition, who immediately want to exploit the discovery. Amongst the romps and pillowfights, the play actually does have something to say about the uncomfortable relationship between science and entertainment. Also, there are velociraptors. In case you’re wondering, no, the photo at the top of this post has nothing to do with this reading, but I hate to post anything without a photo. This is from Mark Knight’s reading at Fergie’s, earlier this summer. ← New production at Quantum Dragon Theatre!